Top o’the mornin’ to ya! Do YOU have any Irish in you? I do – my mother’s maiden name is Kelly. Pretty darn Irish if you ask me! 11%, or roughly 35 million Americans can claim Irish heritage, which is about 7 times more than today’s entire population of Ireland! We Americans can always make things bigger and better, can’t we? Or even make it our own, if need be. Because there’s some Irish in our blood, we usually have reuben sandwiches for dinner on St. Patrick’s Day; it just seems Irish. It’s actually more of an Irish-American food and not a true traditional Irish food. When the Irish immigrants arrived, they usually were pretty poor and had to make due with a cheaper cut of beef, so they learned to pickle the beef to tenderize it. Hence, corned beef. So it’s been co-opted by Americans, kind of like green beer has become a thing on St. Patrick’s Day. I do like to make traditional Irish brown bread for breakfast though. My husband and I went to Ireland on our honeymoon, and we had some of the best breakfasts with rashers, brown bread using Odlams’ whole wheat, all that British-y stuff. Everyone was so incredibly friendly and went out of their way to be helpful. I have great fondness for that country, the people and their food. 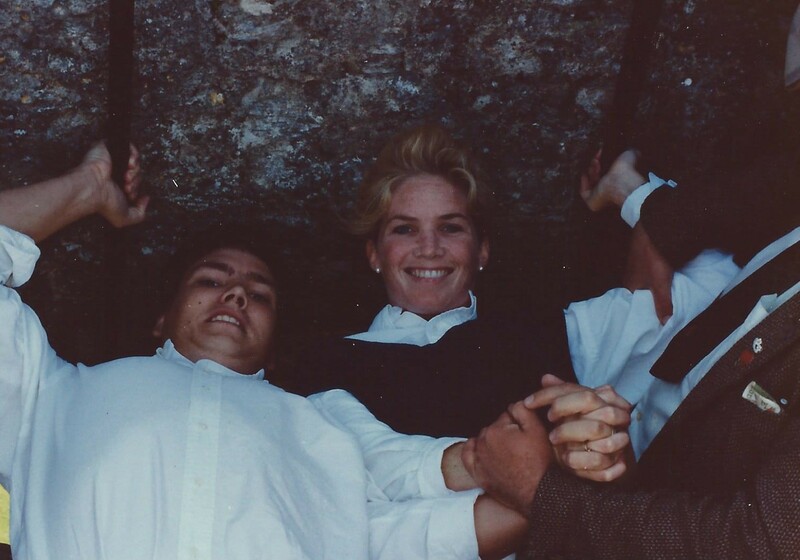 One of our favorite memories was kissing the Blarney Stone. To kiss the Blarney Stone, you have to ascend an ancient tower of old Blarney Castle. And of course, it being a famous landmark and tourist site, there’s quite a que (line) and wait. When you finally get to the stone, you get all of about 30 seconds to lie on your back while a helper holds your hands. The stone is actually the upper edge of a “murder hole,” which is a section where arrows, rocks, and hot oil could be dropped from the roof of a turret though holes. To kiss the stone, you are on your back, with your head dangling some 80 feet above ground. Of course, there are iron grates to protect you from falling to your death, but that’s also why there’s a helper holding your hand. Our helper, being a regular Irish bloke, asked us where we were from. “Oh, what part?” he asked, in that lovely lilting accent. “Ah! Where in Florida? Me and me family just got back from a vacation at Disney World, don’t ya know! ?” he enthused. At this point, with an hour wait behind us, he stopped to chat. I don’t know if it was working in such close proximity to the Blarney Stone, but the chap had the gift of gab! So he gabbed. Talked all about his visit to Cocoa Beach and the Kennedy Space Center. Showed us what was left of his sunburn. Asked about our visit to the Emerald Isle. Told us which pubs we should hit for the best lunch that day. Took pictures of us. Took pictures with us. Made everyone else behind us impatient, and everyone who came before us annoyed because they didn’t get the same treatment. But it made our day. And, I would venture to say, that perhaps it’s because we kissed the Blarney Stone that 2 of our 3 kids have the gift of gab as well! So here’s to all things Irish! And even if you don’t have any Irish heritage running through your veins, may you be blessed tomorrow! Cottage cheese cookies – I’m intrigued!